Winter is in the air! 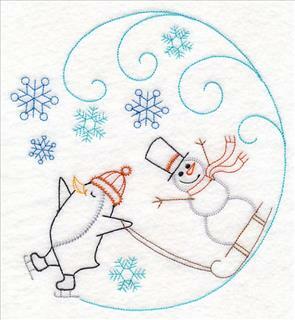 Celebrate your favorite sights of the snowiest season of the year with new fun and frosty designs! 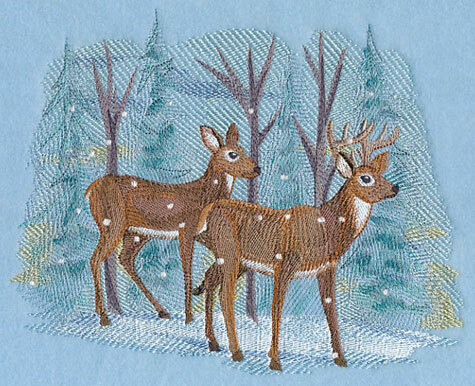 From woodland winter scenes to retro animals wrapped up in scarves, these designs will have you walking in a winter wonderland. A lace snowflake bowl is perfect for holding treats or battery-operated candles. 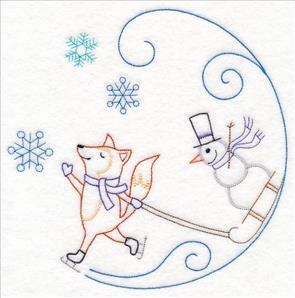 Plus, new lace bookmarks, watercolor snowflakes, sayings and samplers, and "snow" much more! 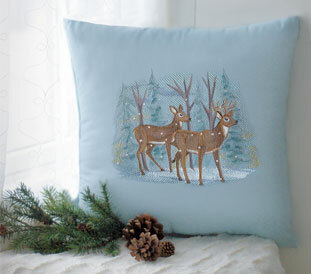 Evoke the beauty of a snowy winter scene in your home with this lovely pillow. Two deer stroll through the woods on a snowy day. Add this showstopping scene to pillows, wall hangings, and more. 8.54" x 6.87" and 7.18" x 5.83" and 5.92" x 4.84"
These winter animals are all dressed up and ready to explore the snowy world around them! 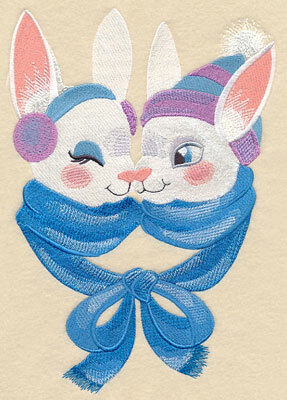 Cozy scarves help each playful pal stay warm against winter's chill. 6.46" x 7.03" and 5.87" x 6.39"
5.34" x 5.81" and 4.85" x 5.28"
6.98" x 6.46" and 6.35" x 5.87"
5.77" x 5.34" and 5.24" x 4.85"
Geometric shapes add bold, graphic style to both the animals and their winter accents. Change the colors of each scarf to match your project! 6.85" x 7.31" and 5.87" x 6.27"
5.33" x 5.70" and 4.85" x 5.18"
6.71" x 6.45" and 6.10" x 5.87"
5.55" x 5.34" and 5.05" x 4.85"
Blustering snowflakes swirl around each animal's head. Pick your favorite, or stitch them all! 7.59" x 6.86" and 6.51" x 5.87"
5.91" x 5.34" and 5.38" x 4.86"
7.91" x 6.46" and 7.19" x 5.88"
6.54" x 5.34" and 5.95" x 4.86"
These winter animals are all wrapped up and ready to play in the snow. Get them all now in a design pack -- regularly priced for only $9.97! 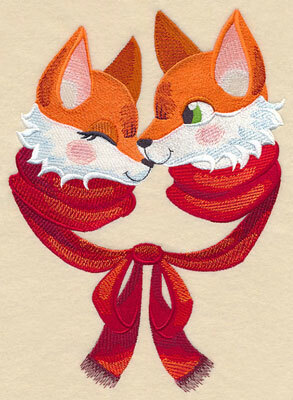 Foxes, bunnies, and deer cuddle up for warmth in these so-sweet motifs. 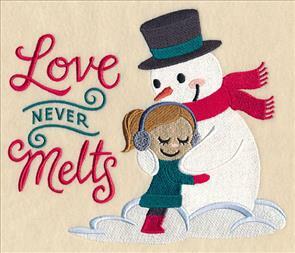 Perfect for adding to winter decor (or even getting a jump-start on Valentine's Day gifts!). 6.85" x 9.57" and 5.59" x 7.81"
6.86" x 9.81" and 5.47" x 7.84"
4.76" x 6.80" and 2.66" x 3.86"
6.85" x 10.22" and 5.20" x 7.75" and 4.60" x 6.87" and 2.60" x 3.86"
A penguin, fox, bunny, and squirrel skate away with their snowmen friends in these light, vintage-style designs. The circular shape makes them great for quilt blocks, hand embroidery hoops, and round pillows, too! 7.26" x 7.81" and 6.37" x 6.86"
5.45" x 5.86" and 4.52" x 4.86"
7.81" x 7.76" and 6.90" x 6.86"
5.89" x 5.86" and 4.89" x 4.87"
These vintage-style designs are best fits for neutral, low-nap fabrics where the stitching won't get lost in the texture. Try tea towels, denim, canvas, quilter's cotton, or twill for best results. 6.90" x 7.77" and 6.09" x 6.86"
5.20" x 5.86" and 4.31" x 4.86"
7.38" x 7.81" and 6.48" x 6.86"
5.54" x 5.86" and 4.59" x 4.86"
The first doodle snowman was so popular, we created a second one! 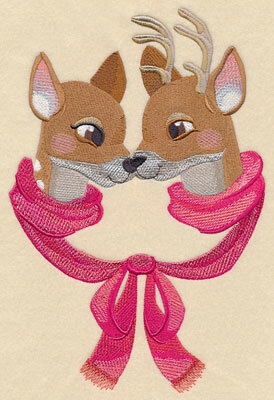 Stitch them together on a pair of pillows, tea towels, or on either side of a tote bag. 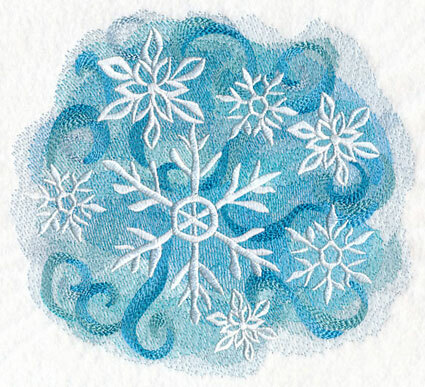 5.85" x 6.42" and 4.85" x 5.32" and 3.51" x 3.85" and 2.73" x 3.00"
A swirling sky stitched in the gorgeous watercolor style is the perfect backdrop for intricate snowflakes to shine. 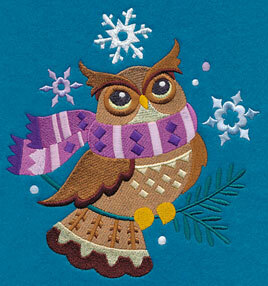 Add to scarves, winter coats, and blankets to decorate your home and apparel for the frosty season. 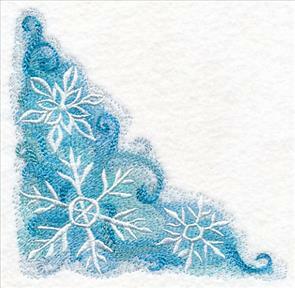 7.80" x 7.33" and 7.00" x 6.55" and 6.29" x 5.88" and 5.22" x 4.87"
Icy blues and silvers give distinct cool-weather style to these watercolor wonders -- great for embroidering your own winter wonderland! 11.72" x 4.57" and 9.40" x 3.66" and 7.76" x 3.03" and 6.83" x 2.67"
Icy whirls of stitching link one snowflake to the next. 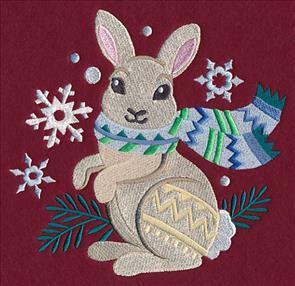 Stitch this design just once, or repeat as a border on the edges of your beautiful seasonal creations. 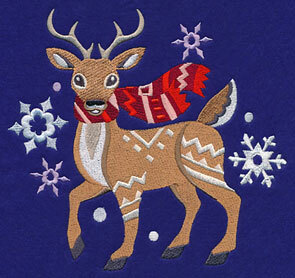 11.74" x 3.31" and 9.39" x 2.67" and 7.80" x 2.23" and 6.00" x 1.87"
In addition to the designs above, a matching corner and accessory will add striking appeal to any embroidery project! 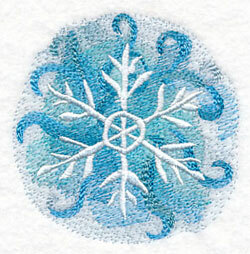 Let a flurry of these watercolor snowflakes land on your next project. Get them all in a design pack! 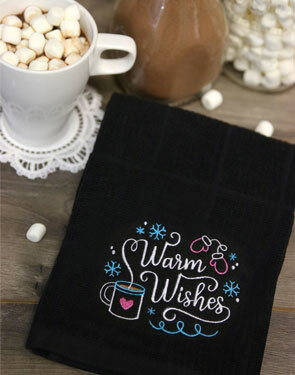 Md - Designs smaller than 7.9" x 7.9"
Sm - Designs smaller than 5" x 7"
What's winter without watching the snow fall while curled up with a mug of hot chocolate? 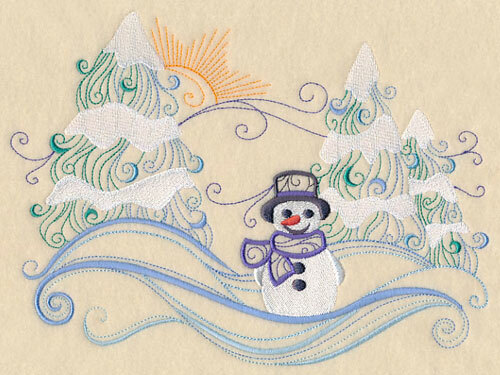 Send warm wishes to friends and family with this wintry sampler. 8.55" x 6.90" and 7.25" x 5.85"
6.02" x 4.86" and 3.86" x 3.12"
Serve a cup of hot cocoa with an embroidered kitchen towel featuring this cozy winter saying. 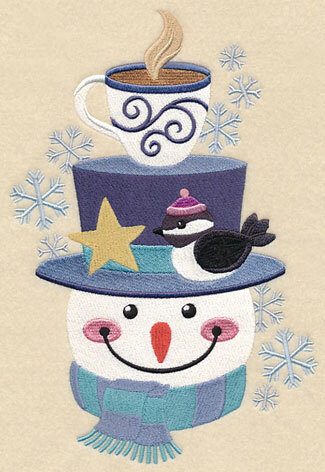 A friendly snowman sits with a sweet bird and cup of hot chocolate balanced on his hat. A brilliant way to celebrate the best parts of winter! 6.90" x 10.06" and 5.85" x 8.53" and 5.36" x 7.80" and 4.71" x 6.85"
Light, delicate swirls give this snowman scene a unique, artistic appearance. 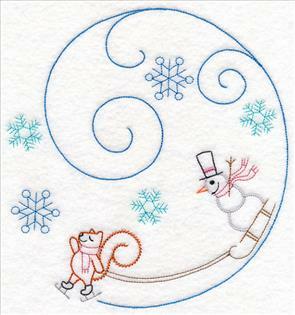 Stitch to spread a little winter cheer through your home. 9.13" x 6.89" and 7.77" x 5.86" and 6.44" x 4.86"
The saying is true -- love never melts. 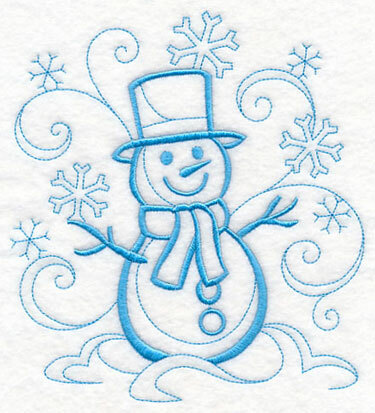 Stitch a project for your favorite little boy or girl with these cute-as-a-button snowman designs. 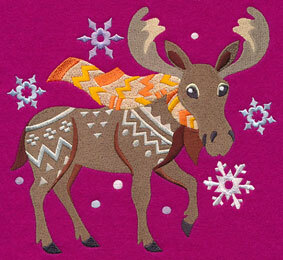 7.79" x 6.59" and 6.92" x 5.86"
7.80" x 6.60" and 6.92" x 5.86"
5.74" x 4.86" and 3.86" x 3.27"
Snowflakes, seasonal flowers, and a frosty color palette give this design a standout appearance on pillows, wall hangings, and sweatshirts. 11.68" x 5.09" and 9.34" x 4.08" and 7.76" x 3.39" and 6.87" x 3.01"
Combine elegant freestanding Battenburg lace with beautiful winter snowflakes in this gorgeous bowl! Available in three sizes, and great for holding battery-operated candles (or sweet treats! 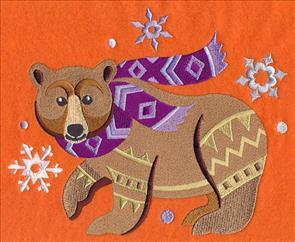 ), it's a must-have addition to any winter decor. 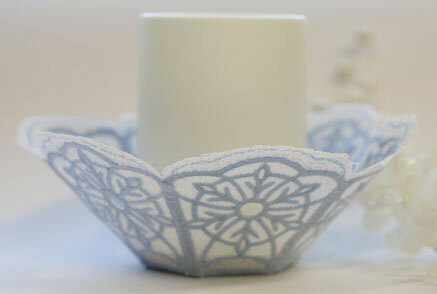 See how to stitch and assemble the freestanding lace bowl here. 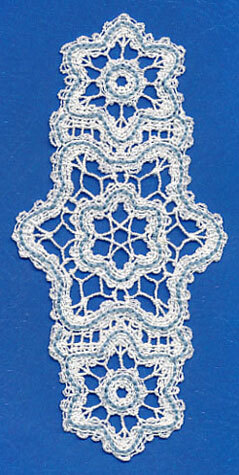 3.42" x 3.87" and 2.69" x 3.05" and 2.07" x 2.34"
This breathtaking snowflake mixes the classic style of Battenburg lace with contemporary rayon. 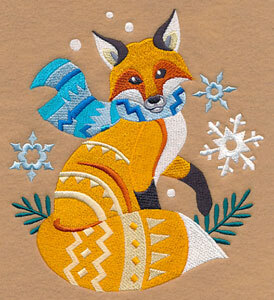 Hang in your window and let the sun illuminate its beauty, slip it in a card, or use as doily and coaster! 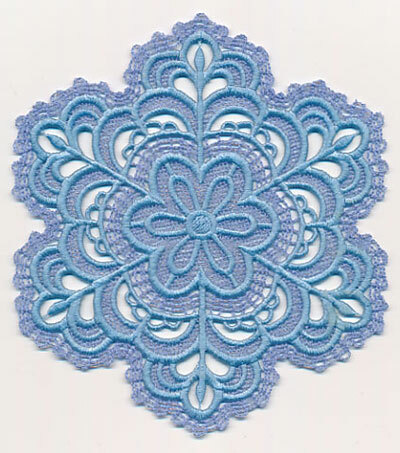 Find our best tips and tricks for embroidering Battenburg lace with rayon here. 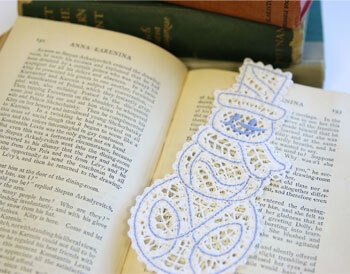 5.85" x 6.61" and 4.89" x 5.53" and 3.40" x 3.84"
Keep your place while reading with lovely Battenburg lace bookmarks in classic winter motifs. Snowflakes and a snowman highlight the cool accents of the season, while a snowy owl and arctic fox bring its fauna to life. See how to stitch Battenburg lace in this tutorial. 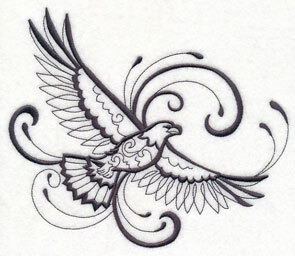 3.21" x 6.88" and 1.81" x 3.88"
2.64" x 6.89" and 1.49" x 3.89"
Intricate Ink designs are always popular requests! 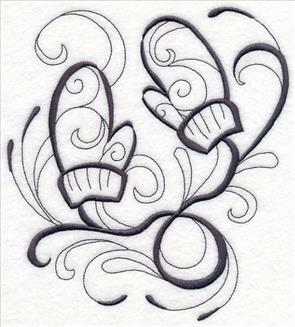 Carla was hoping for a pair of cozy mittens, while Vonnie requested an inky eagle. 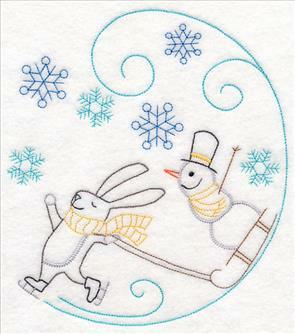 Perfect for tea towels, tote bags, and more! 6.86" x 7.59" and 5.86" x 6.48"
7.81" x 6.57" and 6.97" x 5.86"
5.78" x 4.86" and 3.87" x 3.27"
a popular program, and designs are scheduled through 2017. But we still want to read your ideas! 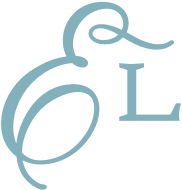 Send them to stitch@emblibrary.com for consideration.